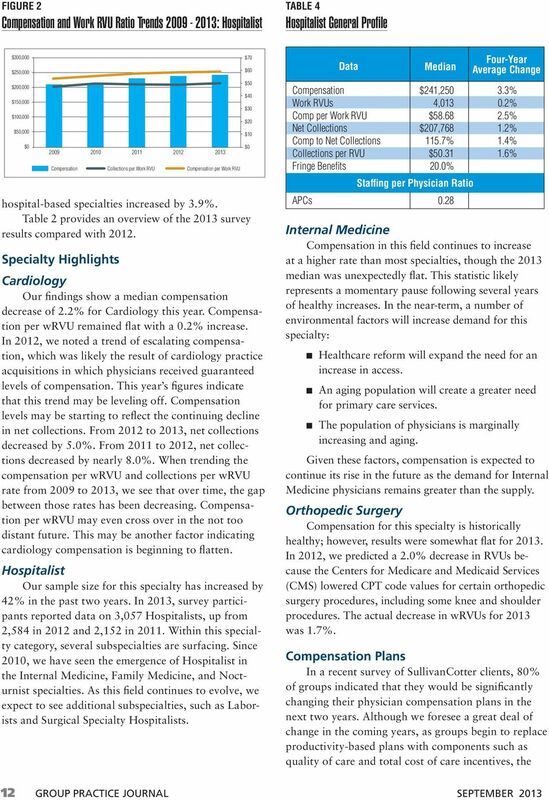 Download "Compensation 2013: Evolving Models, Emerging Approaches"
1 Compensation 2013: Evolving Models, Emerging Approaches Results from the AMGA 2013 Medical Group Compensation and Financial Survey By Bradley S.J. 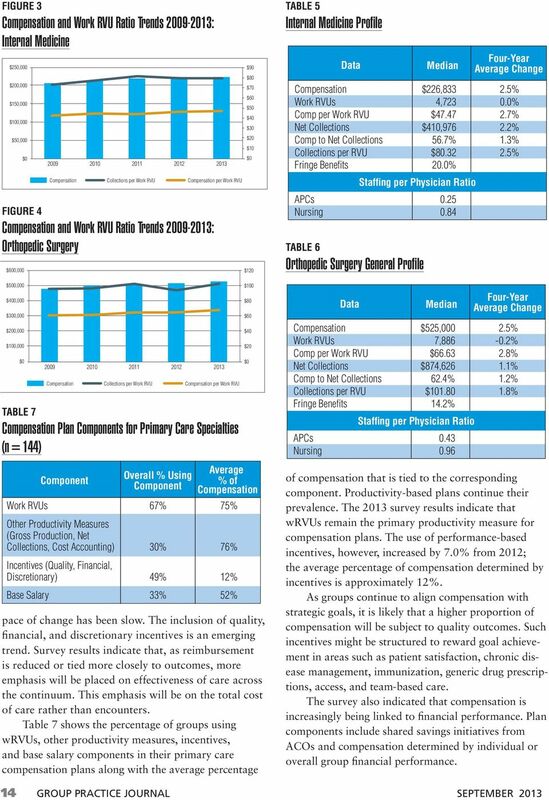 Vaudrey, M.B.A., CPA, and Sara Loos, CCP Findings from the 26th annual AMGA survey indicate that medical groups and other organized systems of care are beginning to adapt compensation practices to accommodate changes in the way health care is delivered and reimbursed. As full implementation of healthcare reform approaches, organizations are taking gradual steps to redesign compensation, with a shift from productivity-based to performance-based compensation plans. 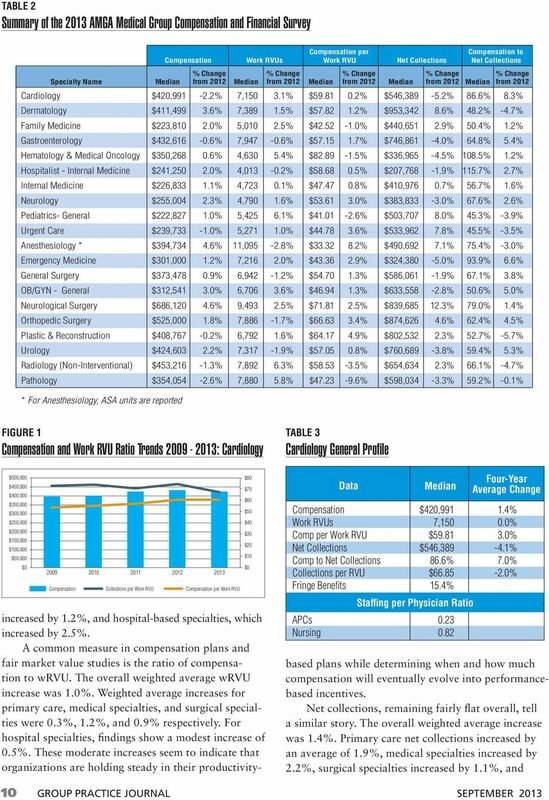 This article offers insights gleaned from the survey data, highlights shifts in certain specialties, and examines how increasing demand and changing reimbursement affects compensation. 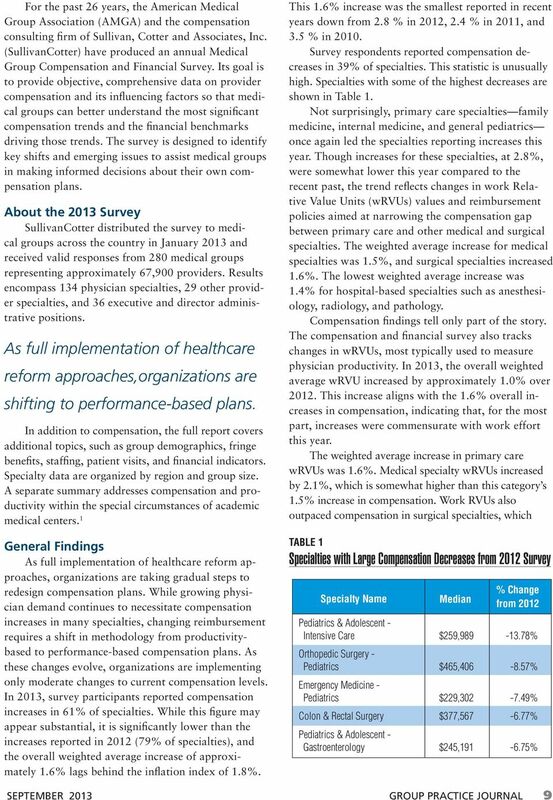 6 Summary The results of the 2013 survey indicate that group practices are slowly but steadily reacting to the changing healthcare environment. Modest changes in compensation could indicate the calm before the storm as physician groups across the country engage in compensation redesign planning. 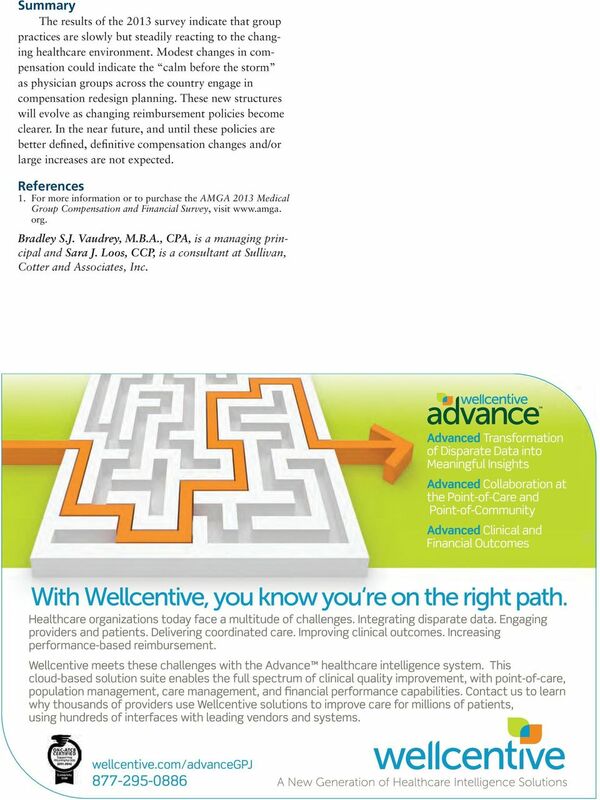 These new structures will evolve as changing reimbursement policies become clearer. In the near future, and until these policies are better defined, definitive compensation changes and/or large increases are not expected. References 1. 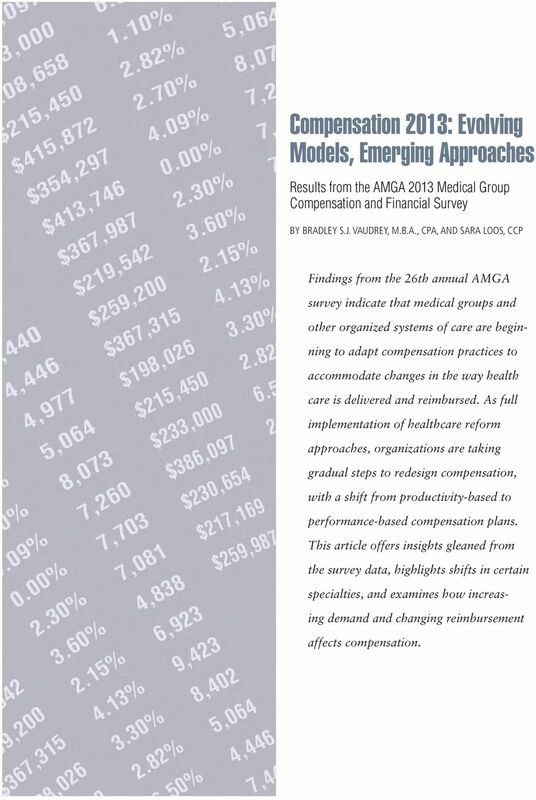 For more information or to purchase the AMGA 2013 Medical Group Compensation and Financial Survey, visit org. Bradley S.J. Vaudrey, M.B.A., CPA, is a managing principal and Sara J. Loos, CCP, is a consultant at Sullivan, Cotter and Associates, Inc.
What if All Physician Services Were Paid Under. An Analysis Using Medical Group Management. the Medicare Fee Schedule? Founding of Hamot Hospital The history of Hamot Health Foundation began on February 7, 1881 with the founding of Hamot Hospital Association.